For the 6 and 6 in 2018, I did make progress. For Judy's UFO challenge - no. But a couple of things got done. I completed Unit 5 for my new project, Sweet Land of Liberty. So, I'm caught up with that. 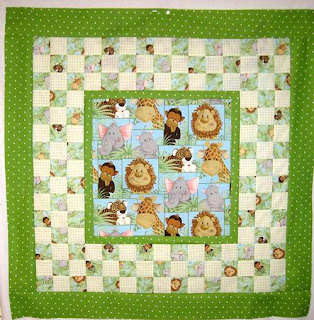 I've decided to make a smaller version of this quilt - as the original would not fit in the space I have in mind for it. I have no other option for wall hangings. 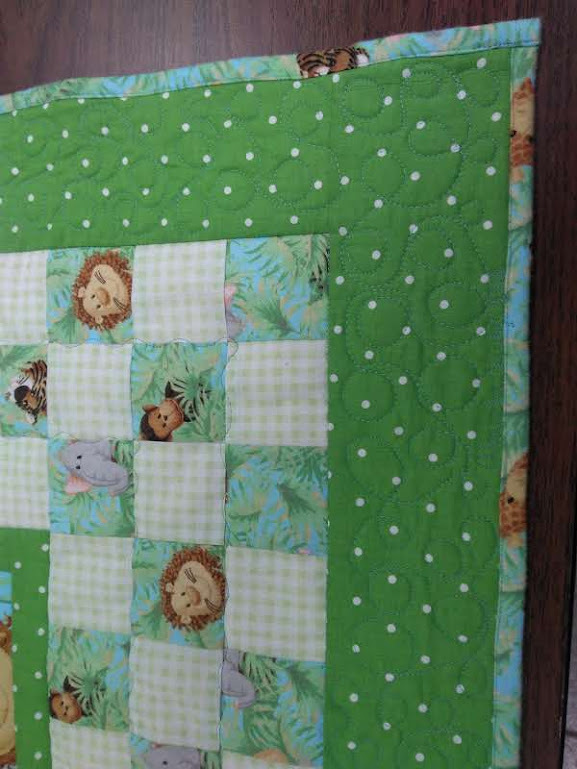 And I finished the commissioned baby quilt. I can't believe I didn't take a photo of it done. Maybe the retreat photographer has one and I'll replace the photo above. I did happen to take one of my signature on it and one of the binding. This was for a great grand son of a friend from church. The baby shower is this weekend. 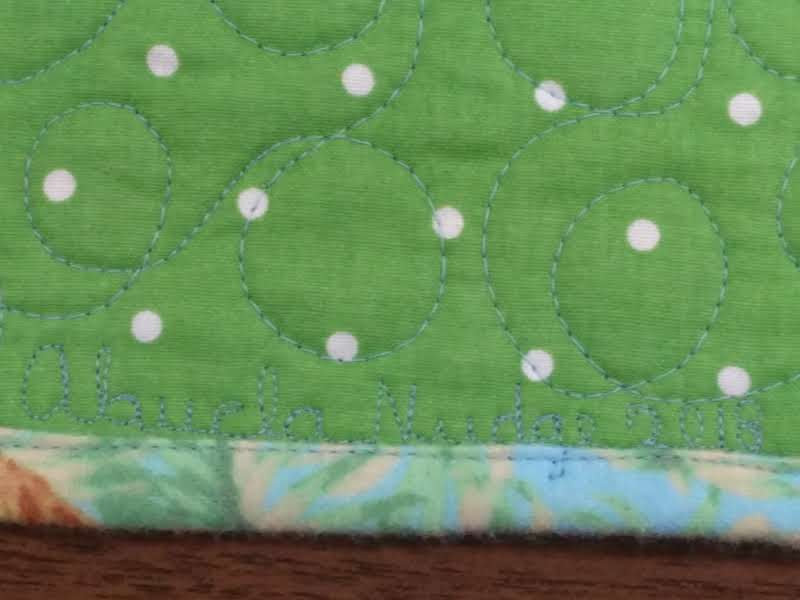 I spent part of a retreat day quilting and binding it. You can see that here - once you can see the photo click on it for short video. I'm linking to the aforementioned blogs in the first two paragraphs, and Esther's WOW. Also linking to Finish it Up Fridays and Can I get a Whoop Whoop? See you there. 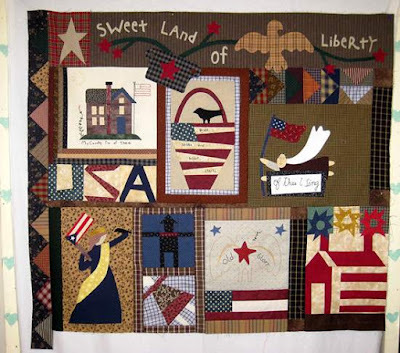 I love your pared down version of the Sweet Land of Liberty quilt. It still gives the "vibe" of the original without all the complexity. I look forward to seeing what else you do with it. Your smaller version of Liberty will be just as sweet as the larger versions. Great job! 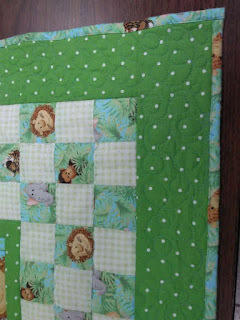 Your Liberty quilt looks great, Angie. 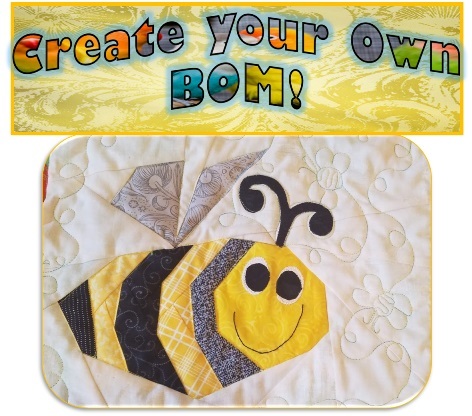 I like the darker fabric you've used for some of the backgrounds. Good job on your smaller version of Sweet Land of Liberty. Everyone's is so unique. I love the alterations you are making to "Land of Liberty"! 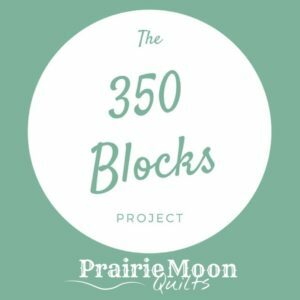 It is going to be fabulous! I won't be posting mine until earlier next week.